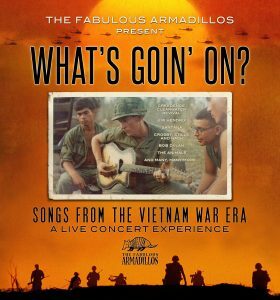 The revolutionary music of the 60s and early 70s served as a touchstone to home for the American troops of the Vietnam War. Everything from Rock, Pop, Blues, Soul, Psychedelic & Country became an escape from the high tension, daily life of a soldier. The FABULOUS ARMADILLOS and their special guests present the contributions of Jimi Hendrix, Creedence Clearwater Revival, Santana, Janis Joplin, The Animals, Bob Dylan, Crosby Stills Nash & Young and many more who reflected this highly politicized era with their music. Purchase 10+ adult tickets & receive a 15% discount.